#5: Risk (for Will, but something I like too). #4 (tie): Nice cookbook from my sister Christine and nice pullovers from Wannamakers (though we have yet to cook anything from this book). #3: Gift certificate from Miles of Golf driving range. #2: Liquor (beer from the Krause’s, scotch from the Wannamakers). #1: Cash (from both Krauses and Wannamakers, the gift that keeps on giving). 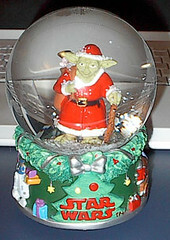 But I have to say that the honorable mention for “favorite Christmas giftie” has to go to the Yoda as Santa snowglobe, which came from my honey. It’s also a wind-up music box that plays “Let it Snow.” I would prefer it play some sort of Star Wars theme song, but hey…. Will with robe and video game. Will with his favorite clothing option, sweats. Let me know if you need any help with the scotch!! !